In an industry fixated on rapid growth, any slowdown in user acquisition or monetization sounds alarms. And Twitter, whether it likes it or not, has been sounding a lot of them lately. 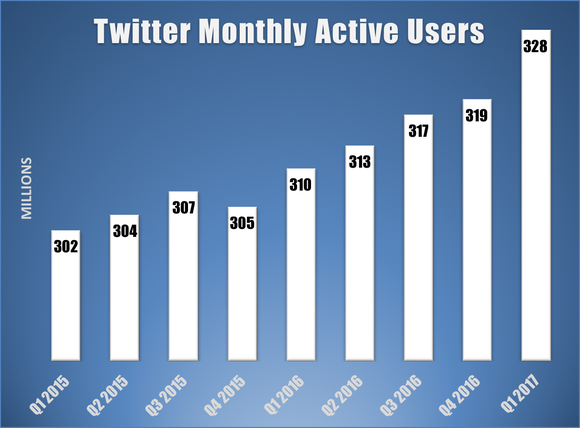 After a few years of stagnant monthly active user growth and disappointing the market, Twitter has been on an upswing thus far in 2017 -- beating investor projections by generating more money and adding more new users than initially anticipated. In the face of a negative narrative, the company has been quick to take action and focused predominantly on changes geared toward the user -- and it seems to be working. Over the last year, Twitter has made a number of changes, small and big, to drive user engagement and improve the overall onboarding and experience of the platform. But we know how tough it can be to keep up with these types of updates, which is why we put together a list of the more notable features and changes below. Marketers, take note. 1) The End of Vine ... and the End of Periscope? When technology companies are struggling to grow, as was Twitter for much of 2016, they will usually do one of two things -- cut staff to make financial ends meet, or develop new innovations to attract and engage users. In Twitter's case, it did both -- Twitter sunsetted Vine and launched an in-app live video streaming feature -- thereby eliminating the need to stream from Periscope for many users. Vine paved the way for the popular short-form and infinitely-looping videos we see on Snapchat and Instagram today (like this one), and in the fall of 2016, it was ultimately shuttered as Twitter shifted its focus to live video content. Vines are still available to share and watch (and rewatch), but now, six-second looping videos must be recorded and shared directly to Twitter or saved to the creator's camera roll. 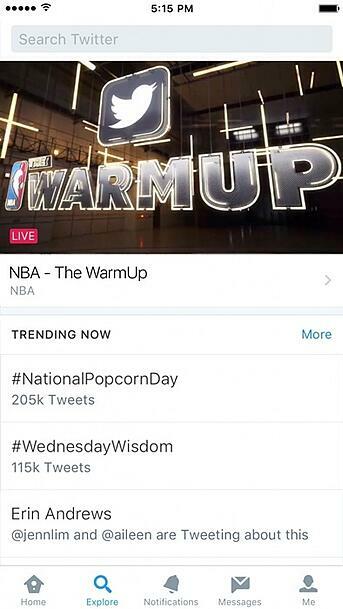 Then, in December 2016, Twitter launched its own in-app live video streaming and recording function -- effectively eliminating the need to live-stream from within the Periscope app. Twitter hasn't discontinued Periscope the way it did so with Vine, so users can still download the app and live-stream videos to their audience there. But these changes in such rapid succession disappointed a lot of avid fans and users -- and reflected Twitter's growing need to keep users within its app. It's no secret that video is no longer just popular -- it's also a requisite element of any successful social media platform. Twitter is trying to innovate its video creation, broadcasting, and sharing tools to give users the types of content they want -- short-form, looping, and live broadcasts -- to compete with other platforms, attract new users, and keep existing users engaged. We haven't seen Twitter jump on the bandwagon of creating an ephemeral video stories feature like most of the major social media platforms -- yet. But we should expect more features and announcements -- like Twitter's deals to live-stream professional sports and breaking news -- that signal its continued emphasis on video content in the future. Twitter's user base has been slowly growing -- and sometimes dipping -- over the past few years, and these UI and UX innovations could help attract people to Twitter, while also preventing users from leaving it. Decluttered UI: Twitter now offers a sidebar menu where users can more easily navigate to their profiles, lists, and personal settings -- instead of having to tap through the app more than once. Real-time reply, retweet, and like counts: Users can now watch the engagement numbers with tweets increase in realtime within the app, instead of refreshing and reloading tweets. Clearer typography and iconography: Twitter changed the in-app font, made some headlines bolder to attract attention in the busy feed, and changed the "Reply" button to a conversation bubble (so it didn't look like a back arrow anymore). Round avatars: Profile images are now round instead of square. Most of the changes were widely panned by users, but this is the internet, after all -- and Twitter will never make everyone happy. Some users pointed out that cosmetic UI changes are not nearly as important as improving users' abilities to report and challenge abusive language on the platform -- and that's next on our list. One of the biggest complaints against Twitter is how easily harassment can spread and exacerbate on the network -- and there was no better test of this hypothesis than political rhetoric surrounding recent global elections. Historically, tweets aimed at threatening or scaring individuals on Twitter have gone unfettered and caused a number of users to delete their accounts or even fear for their safety -- as blogger Ariel Waldman has chronicled. Notification filtering: Users can specify which accounts they don't want to receive notifications from. For example, you can filter out notifications from accounts without profile photos and with unverified email addresses. Mute option: Users can mute specific keywords and phrases, and they can choose how long they don't want to see that type of content. Reporting transparency: Users now receive notifications when -- and if -- Twitter intervenes on an abuse report the user files. Time-out: Users who are reported are sometimes temporarily put in "time-out" while Twitter investigates the report to prevent the further dissemination of abusive content. Safe search: Machine-learning technology will prevent users from being served potentially abusive content when they search for tweets on the platform. Preventing new abuse: Twitter has started preventing reported and flagged users from creating new accounts with the same contact information in an effort to prevent repeat offenders on the platform. We're going to start kicking these people off right and left and making sure that when they issue their ridiculous attacks, nobody hears them. Everybody on the leadership team knows this is vital." Moments present another opportunity for users to get discovered and shared on Twitter, so opening this publishing capability up to everyone was a smart move. 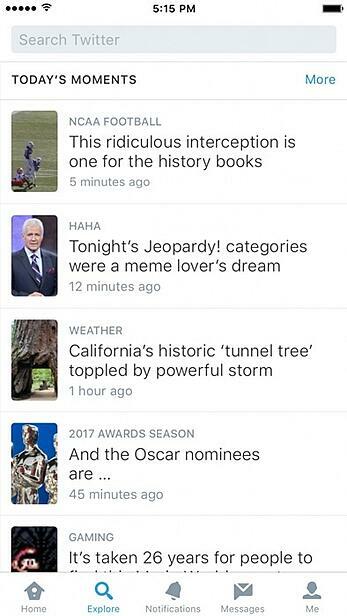 In January 2017, Twitter axed the Moments tab and created the Explore tab on the mobile app, which combined Twitter trends, Moments, and search -- all in one place. 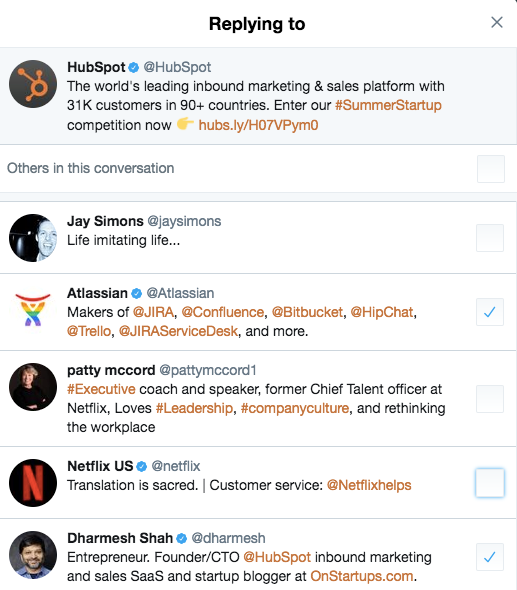 It was a simple new feature that combined features already in existence, but by putting these all in one tab, Twitter made it easier for users to find and engage with new content on the platform -- and hopefully, stay in the app longer. So while Twitter is giving users more room to express themselves, it might also give them the ability to communicate with too many other users if they don't choose the feature above -- especially if bullies and abusers are replying-all to tweets. If you receive private Direct Messages from users you don't follow, users now have the option to approve or deny the request to connect -- and report the message if it's inappropriate. This feature is a win on a couple of levels. It helps users better screen for and identify abusive content -- and choose if or when they want to engage. It also prevents the need for a tweet back-and-forth of asking someone to follow you before you reach out to them via DM. Instead, you can simply shoot them a message -- and they'll approve it if they wish. I wrote the original version of this blog post back in 2016 with a different set of new features, and wanted to make sure you still knew about those neat new(-ish) capabilities, too. As far as debates go, Twitter's 140-character limit is about as contentious as the Oxford comma. Some say the character limit on tweets is essential to Twitter's identity. It secures Twitter in place as one of the fastest available ways for ideas to spread. Others are ready to see it lifted, arguing that removing the 140-character cap would open Twitter up to a new and engaging range of content and possibly new users. One area where the pain of the character cap is particularly sharp is in adding media to your tweets. By default, media links used to take up 23 characters in a tweet, which is about 16% of your allotted characters -- no small portion. 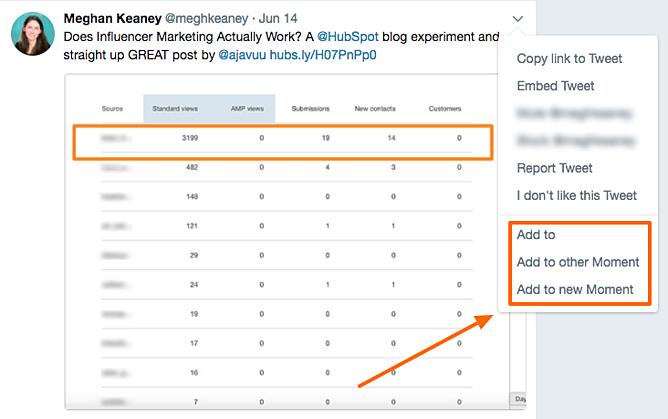 That said, images are a boon for interactivity on your tweets: HubSpot conducted a study and found that tweets with images resulted in 18% more clickthroughs and 150% more retweets. Last year, Twitter announced that media (e.g., images, polls, videos) attached to tweets would soon no longer count against your 140-character count. The same rule would apply to the @handle when replying to someone else's tweet. This update makes a couple of changes to the way replies and retweets are handled. Users will no longer have to add a character prior to a reply -- for example, ". @meghkeaney" -- to ensure their reply is seen by all followers. Not to mention, users will be able to retweet their own content if they want to add a thought to a previous post. One of the ideas generated out of that invitation focused on making Twitter more accessible to users who are visually impaired. In other words, people using Twitter's iOS and Android apps can now add alt text descriptions to images within tweets. Websites have long used alt text to help visually impaired visitors understand the messages conveyed by images, using assistive technology like a screen reader or Braille display. Next to Compose image descriptions, turn that feature on. From there, when you add an image to your tweet just tap Add description to insert descriptive text. 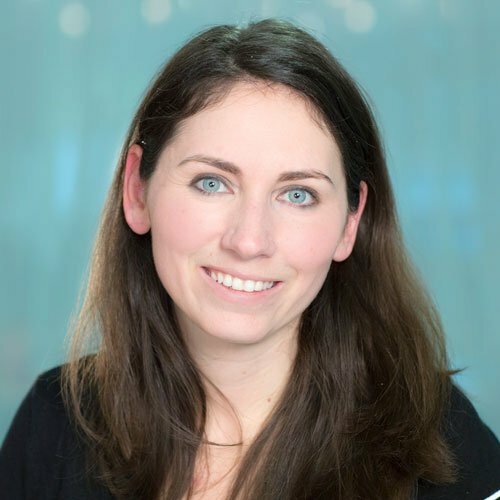 Adding accessibility may seem like a smaller win, but it's a best practice across the board for businesses and organizations looking to grow their audiences and do the right thing. Even though this list isn't weighted for significance, it took real willpower not to place this at number one. As someone whose reliance on GIFs is beyond description, this feature release was a big one for me. In 2015, people shared more than 100 million GIFs on Twitter. When you think about the steps it previously took to share an animated image on Twitter, that number is even more impressive. Previously, you had to leave Twitter, search for the appropriate GIF on any number of GIF search engines, save that image, go back to Twitter, recompose your tweet, and finally, upload the image. Today, with Twitter's new GIF feature, you just click a button and conduct the search there -- no saving or uploading needed. 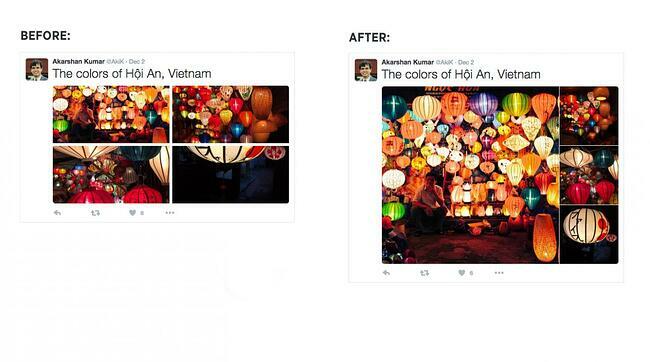 Along with the uncropped photo update, Twitter also introduced a new view for multi-photo displays. This update allows users to see even more of the individual photos included in a collage. In all the punditry on the current and future state of Twitter, most of the narrative to this point has focused on the competition. Twitter's response, however, has been largely focused on its users. While some of these updates may seem small, in aggregate, they signal a move to a much more intuitive user experience fed largely by user feedback. Time will tell if this focus on fan-favorite features amounts to a measurable increase in usage and revenue. What do you think about Twitter's latest features? What else would you like to see? Share your thoughts in the comments. Editor's Note: This post was originally published in May 2016 and has been updated and for freshness, accuracy, and comprehensiveness.